The book was published in Slovene in January 2015 at Modrijan Publishing House under the title “Kapital in past zadolževanja – Zadružništvo kot alternativa”; see http://www.modrijan.si/slv/Knjizni-program/Knjizni-program/Knjige/druzboslovje/Kapital-in-past-zadolzevanja. Endorsements: Capital and the Debt Trap was endorsed, among others, by Vandana Shiva (Navdanya Research Foundation for Science Technology & Ecology, New Delhi), Noam Chomsky (MIT, USA), James Galbraith (Lyndon B. Johnson School of Public Affairs, USA), Jean Ziegler (University of Geneva), Paul Singer (University of São Paulo, presently Brazilian Secretary of State for the Solidarity Economy), Louis Favreau (Université du Québec, Canada), George Irvin (School of Oriental and African Studies, University of London), Robin Murray (London School of Economics), Stephen Yeo (previously Principal of Ruskin College, Oxford), Yves Cabannes (University College London), Peter Davies (University of Leicester, UK), and Anis Chowdhury (Western Sydney University, Australia). The late Prof. Ian MacPherson from Victoria University, Canada, drafted the foreword of the book. Reminder of the book topic. The recent financial crisis has had a devastating impact around the globe. Thousands of businesses have closed down and millions of jobs have been cut. Many people have lost their homes. Capital and the Debt Trap explains how key economies have fallen into a ‘debt trap’, linking the financial sphere to the real economy, and goes beyond, looking into alternatives to the constant stream of financial bubbles and shocks. Overlooked by many, cooperatives across the world have been relatively resilient throughout the crisis. Through four case studies (the transformation of a French industrial SME in crisis into a cooperative, a fishery cooperative in Mexico, the Desjardins Cooperative Group in Quebec and the Mondragon Group in the Basque country of Spain), the book explores their strategies and type of control, providing an in-depth analysis within a broader debate on wealth generation and a sustainable future. How to buy the book? The English version of the book can be purchased directly from the Palgrave website at: http://www.palgrave.com/products/title.aspx?pid=688814. For academic institutions in North America, the book can also be ordered through Raincoast or Indigo, or through Ashton Quinn, the Palgrave university representative in North America (ashton.quinn@palgrave-usa.com). Claudia Sanchez Bajo claudia.sanchezbajo@ymail.com, PhD in Development Studies (ISS, The Hague), was the inaugural Chair in Cooperative Enterprises of the University of Winnipeg, Canada, till January 2015. She teaches at Pavia University, Italy, and previously taught in The Netherlands, Germany, Italy, China and several Latin American countries at pre-graduate and MA levels; she published among other books “The political Economy of Regionalism – Business Actors in Mercosur in the Petrochemical and Steel Sectors” (2001) and contributed to “The Political Economy of Regions and Regionalism” (Shaw, Boas and Marchand. Eds., Palgrave 2005) and “Cooperatives in a Post-Growth Era: Creating Co-operative Economics”, Novkovic and Webb eds., Zed Books 2014). Bruno Roelants bruno.roelants@cicopa.coop, Master in Labour Studies (ISS, The Hague), is Secretary General of CICOPA, sectoral organization of the International Cooperative Alliance for industrial, handicraft and service cooperatives, and its European organization CECOP CICOPA-Europe. He was previously responsible for cooperative development projects in China, India and Central-Eastern Europe. He coordinated the cooperative organisations in the negotiations on the ILO Recommendation 193 on the promotion of cooperatives in 2001-2002. He edited “Cooperatives and Social Enterprises – Governance and Normative Frameworks” (CECOP, 2009) and “Cooperative Growth in the 21st Century” (ICA, 2013); he is a co-author of “Cooperatives, Territories and Jobs” (CECOP, 2011) and “Cooperatives and Employment: a Global Report” (CICOPA-Desjardins, 2014). Claudia Sanchez Bajo and Bruno Roelants, co-authors of the book, wish you a happy new year ! 2. How to buy the book? 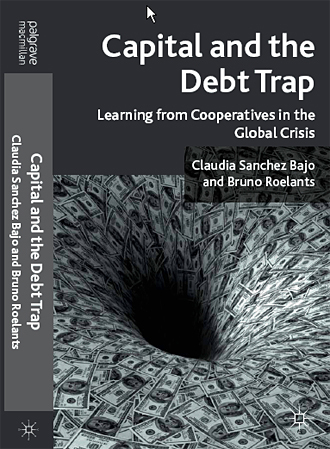 A second edition of Capital and the Debt Trap – Learning from Cooperatives in the Global Crisis came out on 18 December 2013 under a paperback format for the price of 18.99 British Pounds (around 22.7 € or 31.3 US$), against 71 Pounds for the former edition which was exclusively hardback. This new edition comes after very positive endorsements received on the book from a number of academics, among whom Noam Chomsky (MIT, USA), James Galbraith (Lyndon B. Johnson School of Public Affairs, USA), Jean Ziegler (University of Geneva), Paul Singer (University of São Paulo, presently Brazilian Secretary of State for the Solidarity Economy), George Irvin (School of Oriental and African Studies, University of London), Robin Murray (London School of Economics), Stephen Yeo (previously Principal of Ruskin College, Oxford), Yves Cabannes (University College London), Peter Davies (University of Leicester, UK), Anis Chowdhury (Western Sydney University, Australia) and Yang Qian (Training Centre, All China Federation of Supply and Marketing Cooperatives). The late Prof. Ian MacPherson from Victoria University, Canada, drafted the foreword of the book. The new edition contains the same text as the first (2011) one, with the addition of a 7-page postscript, in which you may read that observations contained in the book are still valid and reinforced by the events and trends unfolding since 2011. On the one hand, the global economic and financial structure based on the debt trap has remained basically unchanged with the same level of instability and tendency towards implosion. On the other hand, cooperatives have continued to demonstrate their resilience to crises and their innovation capacity to overcome them. The 4 experiments described in the book (Natividad in Northern Mexico, Ceralep in Southern France , Mondragon in Spain’s Basque country and Desjardins in Canada’s Quebec Province) are doing well, considering the macroeconomic conditions of the countries in which they are based. More widely, cooperatives are showing, on the average, more resilience than other types of businesses in comparable sectors and sizes. They are rapidly developing in crisis-ridden countries such as Greece. The more cooperatives cooperate with each other entrepreneurially through horizontal ensembles, the stronger their resilience appears to be. In this respect, it is worth mentioning the highly-mediatized crisis of the Fagor Electrodomesticos cooperative belonging to the Mondragon group, about which three key considerations should be made: a) the Spanish and European crisis have dramatically hit white goods’ sales, and many businesses in this sector are enduring serious difficulties; b) Fagor makes up around 8% of the aggregate turnover of the Mondragon group, with the remaining 92% doing either reasonably well or very well, according to the different sectors in which they is active, owing this situation to a great extent to the high investment in innovation and R&D implemented by the group; c) the Mondragon group is doing enormous efforts to relocate all worker-members of the cooperative Fagor to other cooperatives part of the group: in total, more than 1000 are to be relocated. Recently, a first batch of 400 workers has been relocated in other cooperatives. As we can see, even in this dramatic case, the cooperative model of enterprise is providing a clear advantage in terms of long-term employment for cooperative members and therefore also in terms of regional economic sustainability. Another event that has been publicized concerns the crisis of the Cooperative Bank in the UK. As briefly mentioned in the postscript, this is a conventional bank: in spite of its name it is not a cooperative bank, namely a bank directly owned and controlled by its members-users like the local banks of the Desjardins group in Quebec, studied in the book. The crisis of the UK Cooperative Bank has deepened since the postscript was drafted, falling under the control of three hedge funds. The reasons for this crisis are specific and would require a specific analysis. What is sure is that it is not threatening the cooperative bank model like Desjardins in Canada, Raiffeisen in Germany or Credit Mutuel in France, which remain among the largest and best performing banking institutions in their respective countries. For academic institutions in North America, we are being advised that the book can be ordered through Raincoast or Indigo, which university bookshops should have an account with. If they do not, it is possible to order it through Ashton Quinn, the Palgrave university representative in North America (ashton.quinn@palgrave-usa.com). Editions are due to come out in 2014 in Chinese at Zhongguo Shangye Chubanshe (中国商业出版社 – China Commercial Publishing House http://www.c-cbook.com/) and in Slovene at Modrijan. We will very happy to receive your comments on this blog if you have read the books in other languages. Prof Claudia Sanchez Bajo, PhD in Development Studies (ISS, The Hague), is currently Chair in Cooperative Enterprises and Assistant Professor at the Business and Administration Department at the University of Winnipeg, Canada. She previously taught in The Netherlands, Germany, Italy, China and several Latin American countries at pre-graduate and MA levels, and published among other titles: “The political Economy of Regionalism – Business Actors in Mercosur in the Petrochemical and Steel Sectors” (2001) and contributed to the book “The Political Economy of Regions and Regionalism” (Shaw, Boas and Marchand. Eds., Palgrave 2005). Bruno Roelants, Master in Labour Studies (ISS, The Hague), is Secretary General of CICOPA, the sectoral organization of the International Cooperative Alliance for industrial, handicraft and service cooperatives, and its European organization CECOP CICOPA-Europe. He was previously responsible for cooperative development projects in China, India and Central and Eastern Europe. He coordinated the cooperative organisations in the negotiations in 2001-2002 in Geneva on the ILO Recommendation 193 on the promotion of cooperatives. He has taught on cooperatives and local development in Italy. He has edited “Cooperatives and Social Enterprises – Governance and Normative Frameworks” (CECOP, 2009), and is a co-author of “Cooperatives, Territories and Jobs” (CECOP, 2011). We would just like to add that we are very happy. We also thank the Midwest Book Review for its critique. The Midwest Book Review is an organization serving community and academic library organizations. It is located in California, Wisconsin and the Upper Midwest and all its reviews are indexed by Gale Research. The 2008 global financial crisis has dealt a heavy blow to the world economy. Till now, the recovery of the economy has still been rather slow. The American economy is lurching forward, the sovereign debt crises in the EU tend to worsen, the emerging markets are fighting against increasing inflation, the IMF keeps downgrading its forecast for economic growth and the global economy is full of uncertainties. This financial crisis prompted the political and business leaders in the world to have a rethink and triggered expert opinions and numerous symposia and academic papers. Apparently, the economic crisis has pushed the world towards a more rational direction. Capital and the Debt Trap combines a searing critique of the unstable debt- and-profit driven system that came close to final collapse in the Great Crisis with a fine portrait of the modern cooperative alternative that exists today in Mexico, Canada, France and Spain. Are these perhaps the small creatures that will survive and flourish after the great dinosaurs are gone? Let’s hope so. Author of The Predator State: How Conservatives Abandoned the Free Market and Why Liberals Should Too. This book presents a thoughtful and exciting consideration of the roles cooperatives can play – and should be expected to play – today… It deserves to be widely read and discussed within and across the boundaries that have long divided cooperative proponents and the general public. This book is a major step forward in understanding the working of co-operative economies. Its appearance could hardly have been more timely. At a point when the global financial system and the models of economic governance have been thrown into question, it shows how it is that co-operative financial systems are more crisis resistant than contemporary private banking, and how finance can be structured to service long term local and industrial growth rather than subject it to the imperative of short term profitability. More generally, the authors describe an architecture of co-operative governance that has not only been innovative and resilient but is particularly well suited to any post crisis world that is reshaped round multi stakeholder engagement. This is a timely and important book which both analyses current economic turmoil and shows how the crisis may foment new and more co-operative forms of enterprise. Anyone interested in advancing the cause of participatory ownership as one means of guarding against recurrent crises should read this book. This book is simply a masterpiece on cooperativism for the xxi century. Forward and outward looking, from exceptionally well informed cooperatives analysts. It outstandingly demonstrates why cooperatives are more resilient to the crisis and avoid falling into the dept trap and its implacable cohort of inhuman effects. A decisive contribution not only to economic democracy but also to Democracy as a political system by which men and women preserve and control our common good and common wealth, on the basis of one person-one vote, independently of their wealth or capital. A rational and passionate book of hope for our common future. Since the book “Capital and the Debt Trap” will be available next August 28th, we have requested our editor this file to post it on the blog. The Foreword was written by Emeritus Professor of History Ian MacPherson, from University of Victoria, in Canada. We are sincerely grateful to his sharp and deep analysis of the book. First and foremost, because we highly respect Professor MacPherson’s work and knowledge of cooperatives. So, here they are, a few pages especially for you! Read here the book contents, foreword and first pages.